For me, a Christianity without the expectation of Christ’s return has ceased to be one grounded in real hope of God’s will being done on Earth as it is in heaven. If there is no hope for historical intervention – if our faith is only in eschatology after death – our hope seems wishful thinking, so far has it gone from the words of Jesus and the teachings of Paul. It might have been 2000 years so far, but no-one has to wait more than one life-span. Once it’s been 100 years, it might as well be 1000 – in one sense. In another sense, we live in our forebearers’ time too. If Christ returns fifty years after my death, or if I can believe strongly he will, that means something different than he may return sometime in the next million years. 1. We are waiting for the last people group to be evangelised, to have the gospel proclaimed to them. The Bible wasn’t exactly wrong – the writers just didn’t know how big the Earth actually was, that it stretched so far beyond the Roman empire. This is the position of a certain kind of fundamentalist, probably into missions – and part of the impetus behind the 19th/20th century missionary movements? Or, we are waiting for something to do with Israel, the Jews and the Books of Romans and/or Revelation. 2. Jesus has already returned, but it was invisible or known only to a select few. This is the position of some cults. 3. Jesus didn’t actually expect to return soon; the gospel writers have misunderstood him. Thus we can trust Jesus but not the Bible. 4. The gospel writers do not actually say that Jesus is to return very soon. For example: many of the eschatological passages actually refer to the destruction of the temple – N.T. Wright. This is also the position of fundamentalists who cannot imagine different parts of the Bible saying different things, and thus read the gospels through the explanations in Peter’s letters for the delay of Jesus’s return. 5. Jesus and the Bible both expected Jesus to return soon but neither was wrong – God’s plans changed, because he has an openness to events in the world. Many films work hard in their opening scenes to establish sympathy with their central character. 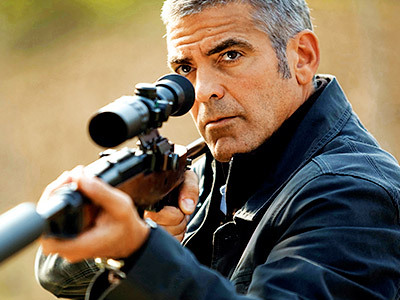 Not The American – we witness Jack (George Clooney) shoot dead his lover when she witnesses him dispatch a would-be assassin. What sort of man are we dealing with here? We see very little sign of moral anguish in Jack – although late in the film, he has a flashback to the scene, perhaps a sign that he has changed. Jack constructs weapons, but he wants out. He accepts one last job, and moves to a small Italian town to build the weapon to the right specifications. He is befriended by a prostitute and a priest, both of whom want to help him, and both of whom think the first step is for him to confess his secret. Jack is constantly looking over his shoulder – who is going to try to kill him, the unexplained Swedes, the priest, the prostitute or the woman assassin he is building the weapon for? It is never made clear who Jack is working for. Mainstream films will tend to justify the violence of a hero. The justness of their cause is established; good and evil are clearly defined. But the absolute absence of motives or reasons makes the violence seem meaningless. It’s like the black spy versus the white spy in Mad Magazine – who’s the goodie? There isn’t one! The rejection of the myth of redemptive-violence makes it a film closer to an Anabaptist’s understanding of the nature of violence and its effect on humans. The other interesting angle for Christians is the redemption offered to Jack by the priest and the prostitute. Both want to draw him out of his solitude, to bring him to a point where he can trust another human. The priest tells Jack that Jack knows hell is real – he isliving in it, because he is living in his unconfessed sin. The prostitute genuinely cares for him, and pursues him as a lover rather than a client. But he illustrates so clearly that if you are not trustworthy, you cannot trust others. She has a small gun in her handbag to protect herself against clients; he assumes she is trying to kill him. There is small redemption at the end of the film, where he decides to make a new life with her, even though it proves to be too late.